Captcha are those challenge-response security fields where it makes you enter a word/number (like the one you need to fill in every time you want to post a comment on this blog), in order to verify the poster isn't a bot. These are not completely spam proof, but ever since enabling it I've seen spam comments on my blog drop to an average of about once a week. Captchas are randomly generated, but every now and then I stumble upon a captcha that is truly idiotic, especially if they are based on dictionary words. 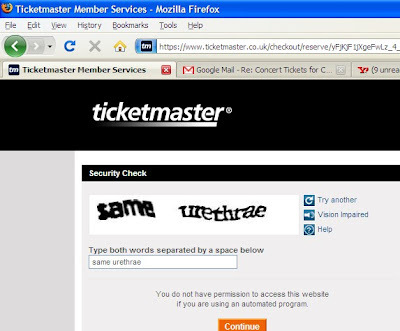 Here's one I got today whilst wondering around Ticketmaster.